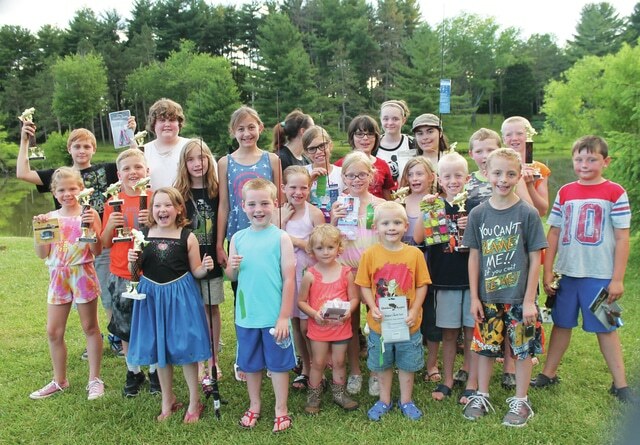 The Casting Competition was hosted by the Greene County Fish and Game Association on June 13. At this event kids cast on dry land at hoola hoops and a large paper target to tally up points. Kaylyn Damron, Ethan Williams, Nick Williams, Abigail Damron, Nicolas Elam, John Atkins, Cameron Atkins, Sophia Garrison, Spencer Garrison, Chase Keys, Derrian Funkhouser Kaden Kurtz, Christian Greene, Nicholas Greene, Garrett Hunsucker, Hannah Staats, Christy Price, and Danielle Price either won trophies or ribbons. The Greene County Fish and Game Association held its Fishing Derby, June 13. Terry and Dave Cope helped run the event which drew 28 kids to fish. All the youth earned prizes, with some getting trophies and ribbons. Participating at the lake were Sophia Garrison, Kaylyn Damron, Darrian Funkhouser, Cameron Atkins, John Atkins, Christian Greene, Chase Keys, Dylan Withrow, Rianna Withrow, Amber Kurtz, Kala Kurtz, Kaden Kurtz, Nicholas Greene, Caden Shinkle, Abigail Damron, Spencer Garrison, Ethan Williams, Nick Williams, Nicolas Elam, Garrett Hunsucker, Danielle Price, Arianna Collier, Makayle Collier, Kimberly Kurtz, Christianna Price, Holton Massie, Cierra Collier, and Hannah Staats. The Greene County Fish and Game Association will host the Jakes/ Youth Training Day, six events from 8 a.m. – 3 p.m. on June 20. All equipment and ammo is provided by the club. Lunch will be served to all participants and aids. Everything is free for the kids. SPRINGFIELD — The fourth annual charity golfing event, “Driving with Colleen,” is will be held at 2 p.m. June 28, 2015 at Locust Hills Golf Course in Springfield.The event will cost $60 and includes a dinner. All proceeds from “Driving with Colleen” will be donated to Circle of Victory, an amazing foundation that provides financial help to cancer patients who live in Greene County, Ohio. Colleen Cain started this event while battling cancer herself to help other cancer patients. Unfortunately Colleen lost her battle last November. Over the past several years Colleen has raised over $10,000 for Circle of Victory. To register, sponsor or donate, or for more information, please visit www.drivingwithcolleen.org. CINCINNATI — Couples will be stepping up to the plate for their dream wedding at Great American Ball Park at the third annual “I Do’s On The Diamond” on Friday, July 31, presented by DateNightCincinnati.com. Fans can enjoy all the fun of a wedding reception before the game. This special “Wedding Crashers” ticket package includes a View Level ticket, a Reds-themed Wedding Koozie and $10 concession credit for food and beverage. Plus, we’ll have a DJ in the Kroger Fan Zone playing all your favorite wedding songs starting when gates open at 5:40 p.m. until the first pitch of the game. Tickets available at reds.com/reception. Fans are encouraged to donate gently used bridesmaid and prom dresses at the July 31 game to receive a voucher for a $10 View Level ticket for the September 6 game. Vouchers will also be available for all donations dropped off at the three Cincinnati area Appearance Plus Cleaners locations. Kenzie’s Closet, a nonprofit organization, provides complete prom attire for financially-disadvantaged junior and senior high schools girls in the Greater Cincinnati region. More information is available at reds.com/reception. Couples participating in the “I Do’s On The Diamond” on-field wedding will say their vows in front of thousands of fans before the Reds vs. Pittsburgh Pirates game at 7:10 p.m. An officiant licensed by the State of Ohio will conduct the ceremony. Following the pregame ceremony, the newlywed couples will join 12 of their closest family and friends to party the night away like a VIP in an exclusive reception featuring an upscale dinner and open bar. The night will be capped off with unparalleled views of the post-game Rozzi’s fireworks show, which will feature a soundtrack of wedding-themed music. The “I Do’s On The Diamond” wedding package includes a congratulatory scoreboard message, special Reds favors and decor and photo opportunities with the Reds mascots. For complete details, visit reds.com/wedding or contact the Reds Special Events Department at events@reds.com.